The designer says Star Harbor International Center will facilitate traffic and boost the urban development of the North Bund. 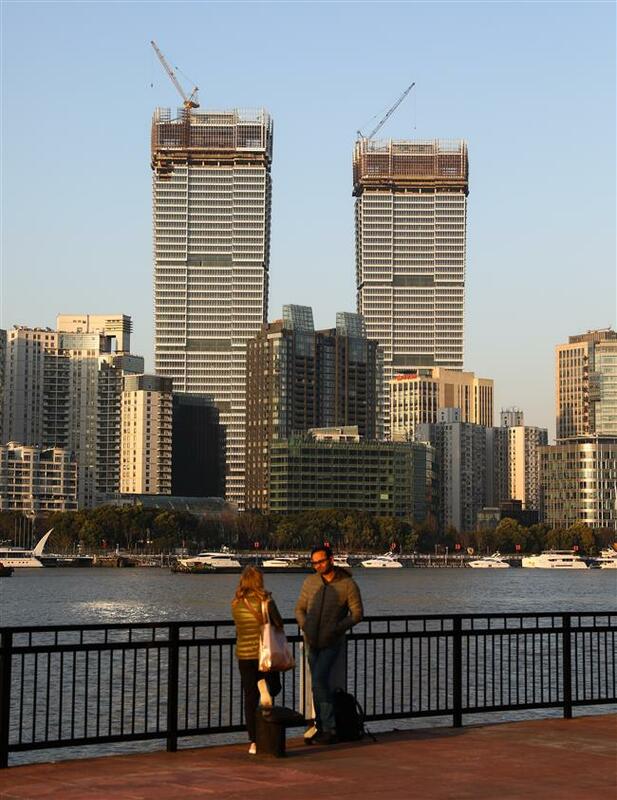 Two foreigners chat at the Huangpu riverfront in the Pudong New Area against the backdrop of Star Harbor International Center across the river. The city’s tallest twin-tower building, Star Harbor International Center, is nearing completion and likely to open to the public in the second half of the year. The complex will facilitate traffic and boost the urban development of the North Bund, said the Institute of Shanghai Architectural Design and Research, designer of the complex. The 263-meter tall building on Haimen Road will have the largest traffic hub in Hongkou District after completion. It will also have the deepest underground space among civil buildings in Shanghai to resolve parking issues and provide a vertical interchange for public transport. It has been dug 34.8 meters deep. According to Sun, the center is designed as a TOD (transit-oriented development) project, a complex that focuses on the orderly dispersal of passengers. On the B1 floor of the center there will be a 4,000-square-meter bus hub. Four bus routes will terminate at the center, but the exact routes are still being worked out. In order to provide a better environment, the height of the B1 floor is set to be 9 meters which will make the underground space more spacious. It will also allow more fresh air and reduce the influence of exhaust emissions from the buses. While planning Star Harbor International Center and its surroundings, Hongkou District tried to connect all the buildings as one centralized complex. Lu Jiwei, former chief of Tongji University’s architecture department, a member of the team which took part in the design of the North Bund CBD, told Shanghai Daily that a set of air corridors will be built to bridge the center and the other three buildings next to it. One of the buildings is the center, another is the Shanghai Industrial Holding Center which is also under construction. “The air corridor of the other two buildings is still being planned,” said Sun. Lu named the air corridor “Green Street” as they will be decorated with plants. By building air corridors, Lu wished to decentralize the people on the ground. “We want people who work or shop in the buildings to go to the traffic hub through the air corridor to reduce the pressure of ground traffic,” Lu said. The North Bund already has the 320-meter high White Magnolia Plaza, the highest building in Puxi. After the Star Harbor International Center is open to the public, the two buildings will echo each other at a distance to form a distinctive skyline for the North Bund.